Use for a tight grip! Larger teeth give increased holding strength, ideal for end grain and particle board applications. Made of die cast zinc alloy. Has a self tapping harpoon thread. Thread listed is the size of the internal thread size. Kitchen chair had similar inserts that pulled out and/or crumbled. These inserts were slightly larger and fit very solidly in locations where we replaced damaged ones. A perfect repair for the on chair that needed repair. Used old bolts that were also 5/16 -18. Will probably need more for future repairs on the 5 remaining chairs. Wife’s happy as am I. Please keep in stock. These inserts replaced threaded inserts with shallow threads because they were in end grain. After the shallow threads pulled out when tightened, I bought these and they are holding very well. 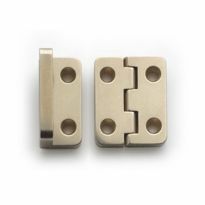 Use these to secure upper and lower cabinet sections. 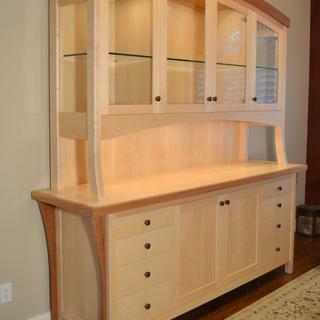 The inserts hold down the upper section to the lower counter top. USED TO ADD DIFFERENT USEFULL THINGS TO MY WORK BENCH. For what I used them, which was putting a bolt in some 3/4" boards, they worked great. I really like the longer length. There was so much more thread. The whole project seems sturdier. They could be a problem in a much thinner board, but I rarely use them in less than 3/4" anyway. Excellent product and works as advertised in an end grain application. However, the supplied installation sheet needs the table revising to clearly show the correct drill sizes for softwood / hardwood applications. They are very useful for take apart & reassemble Furniture such as back Paneling of A desk the center panels of A desk that has 2 cases of drawers & a chair opening in center,The panels at the back of the Chair opening need to be assembled with threaded inserts on right & left side so it can be carried to the customers house in 3 peices & reassembled in the house so it will go through all interior doors. It works perfect. The set of chairs is back to normal. These hex drive threaded inserts worked better than the original ones that I replaced. Much heavier duty so I didn't even have to re-drill the holes. This product was exactly what I needed to build a knock-down book shelf. I had bought some salvaged fronts from built-in closets and need to build a large frame. Since the finished bookcase would be too heavy and bulky to easily move from room-to-room - I opted to build a knock-down version. These inserts were the perfect solution. Boght 40 for floor leveler a for modular train table. Worked perfectly. Did the job as advertised. I build "retro-industrial" furniture and use these in the bottoms of plank table tops to attach leg structures to the tops. 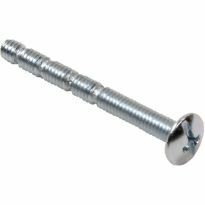 Rather than simply running wood screws into the top, these allow the use of machine screws that can be installed and removed numerous times without tearing out of stripping wood-screw holes. Especially useful for any application where things need to be taken apart and reassembled occasionally. Easy to use if you know what you are doing. I repaired two out of the five feet of my ottoman and they are sturdier than the originals. Works very well in Hard woods when others do not. recommend using it on cherry,maple,oak, et.al. Have a futon with wooden arms with magazine holders. The original threaded inserts which held the futon frame to the arms were so thin they cracked and the bolts literally pulled out and the frame collapsed. After several failed attempts at repair I bought these tapered hex inserts for 5/16&quot; bolts. With a 1/2&quot; pilot holes these worked well and the futon is better than new. The secret with these inserts is using the correct size pilot hole. My suggestion is that you test fit an insert into a scrap of the wood you are using to make sure you find the right size pilot hole that will allow the insert to be put in place without too much resistance that the insert breaks or you split your workpiece. Also, I put these inserts in by hand using a double nuted bolt that I screw all the way into the insert and then lock the bolt with a double nut and use a small socket and ratchet to drive it in place. You will not break the insert this way. If you are trying to drive these inserts with a power drill you are asking for trouble. Worked perfectly. I can't understand why others had trouble, because these were so easy to install: Drill a hole; Put a hex drive on a socket wrench; Turn.I've used the 1/4&quot; size in Maple and Red Oak--both end grain--with absolutely no resistance, breakage, splitting, etc. And they hold tight, unlike some of the T-nut options out there.I used a 7/16&quot; bit for both, but if you simply read the back of the package, the suggested bit sizes are listed for hardwood or softwood applications. A 15/32&quot; bit is recommended for hardwood (NOT a 3/8&quot; hole, as others mentioned). I always start with a smaller hole first, however, because you can make a hole bigger, but not smaller! 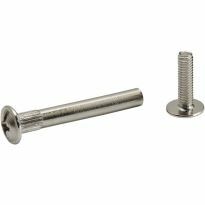 The 7/16&quot; hole worked on the first test--held fast, and the insert went in with no more torque than needed to run a machine screw.Great item. I used the inserts to repair 33 office chairs that had been delivered and set up by a vendor. The people who assembled and installed the previous inserts did not tighten them even hand tight. When I was called upon, months later, to repair the chairs, I used your inserts which were slightly larger and therefore were a perfect fit for the project. I used an 8mm Allen driver in a half-inch driver drill to drive and torque the bolts. Perfect solution to a problem that could have been prevented, but wasn't. Worked extremely well in end grain. Used the recommended bit size and a 3/8 drive hex metric socket, 3' extension and ratchet handle. Used parafin to lube threads before installing. Very easy and smooth install. Easy to install. Design your own knobs and use these inserts for a custom look. Nice product. I would recommend using a smaller bit than 1/2" for hardwood first like it said in the instructions. These inserts were quite easy to use in end grain red oak. The one downside is the instructions for hole size packed with the inserts is wildly inaccurate but it's no big deal to make a couple of test hole and find the right size. These worked very well in the end grain of baby crib I made using cherry! I used a 15/32 drill bit for the starter holes and had no trouble installing them with my hex wrench. I've been using these inserts in the furniture that I build for my customers. After stripping out the allen socket multiple times, I cut down a bolt slightly so that it doesn't protrude past the end of the insert, then used a socket in my cordless drill to drive the insert in. This method works really well. I initially tried to install the insert by using a hex bit in my hand drill. That doesn't work very well and I had to remove a couple of broken inserts. I removed them by using epoxy, inserting a 1/4 - 20 hex nut and turning over the board so that the epoxy would flow towards the bolt. Next day, a wrench removed the bolt and insert easily. I found that using a ratchett works well. Worked great. You just have to make sure the correct size hole is drilled. I installed mine into red oak with a hex wrench with no problems. These inserts may help in some applications. Once installed properly they can provide a solid thread base. My only beef is that the chart provided is not correct. Be sure to try a scrap piece of wood first or you may be in for a surprise! The drill bit called for in the chart for use in hardwood will allow the insert to drop into your hole with no tread contact. Worked well however did strip out/crack some hex inserts while installing in Ash - solved by wobbling the drill just a bit to enlarge the hole slightly. Then all was fine and trouble free. These work well. Do NOT, however, go by the chart packaged with the inserts. I bought the 1/4", and the insert indicated I should use a bit almost 1/2" in diameter. Fortunately, I tried it out on leftover stock before drilling into my project. Unfortunately, I spent about $10 on a bit that was WAY too large--the insert literally just fell right through the hole. (The specification was not for a 1/2" or standard size, but for a unique size not included in any standard bit set; it was, consequently, quite expensive.) After trying out some bits in my collection, I found that a 3/8 bit works well. So the product is good, but the instructions are very costly. Wish I had purchased the bit at Rockler, where I could have asked for my money back. Unfortunately, I had to go to Home Depot, and they obviously couldn't be expected to accept the return. As with many of the folks reviewing these I had 1/2 of the first package strip out the hex hole and then mushroom, causing the entire end to shatter. I'm going to try for the larger pilot hole and hope that works along with the double nut and bolt idea. The ultimate problem is the poor quality steel used. At almost $1 each they should be much stronger and better made. This pot metal barely works in hardwood. Test holes a must because the recommended sizes were impossiblly too small. I had taught myself the double nut method driving hanger bolts for table legs. After stripping a couple hex inserts I applied the double nut. I came to write my tip and found Duane making the same recommendation. I use these inserts in the aprons for the rockler table angles. I have to enlarge one of the holes to 5/16 to fit the 1/4 hex bolts I use. They worked well except in end grain. I did not have the bit size called for in the plans so I had to make due with 3/8&quot;. The hex slot needs to either be slightly deeper or a tighter fit. I will certainly try to use some wax before next time. I would like to ask for some help. I need to get a few of the inserts out and could use some suggestions. Any help is appreciated. My experience was similar to others. I am making my transitional bed out of Cherry, and the inserts stripped out with a 3/8&quot; hole as directed. I found the 11/32 worked better but was still not foolproof. Harder material and a better fit for the allen wrench is needed as a real sloution. I, too, am building the 3-in-1 transitional bed in maple. It doesn't help that the packaging doesn't say what size allen wrench to use to drive them. I've found that 6mm works best, but it's still a loose fit. A 3/8&quot; hole is recommended for hardwoods, but that's not big enough. The plans call for 3/8&quot; holes everywhere except endgrain, where it calls for 13/32&quot;. I've re-drilled all holes to be 13/32&quot;, and I'm still stripping some of the inserts. 7/16&quot; is too loose, but perhaps some epoxy could fix that. I'll definitely try the beeswax idea mentioned in another review before trying larger holes. The metal ripped on some and on others the metal is stripped after use a few times. Slotted brass inserts break when putting into hardwoods. to try the internet and your name came up so I checked your inventory and found what I needed. Works great! Easy to install. the hex drive and you are only ones that have them. I have a piece of furniture where one of these items failed, so I need to replace it. Recommended in the plans I purchased and not available locally. I used these for holding my stair rails for sliding material into my basement workshop. When the rails are not being used the inserts are barely visible. I broke one of these trying to install it with the ice cream scoop kit. It matched the exact size that I needed to replace. 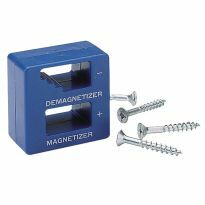 I will be using this in conjunction with the Connector Bolts from Rockler for knock-down furniture. My husband needs it to build a bed frame that was in his wood magazine. 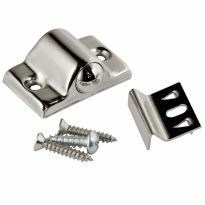 I bought these to hold parts of a bed, I am building, together to aid in disassembling when it has to be moved. how deep are the internal threads? how long is the overall length of the insert? BEST ANSWER: The threads go all the through. This is not a blind insert. Overall length is 13/16"
Best threaded insert to use in 3/4 plywood edge to draw edge into a dado and then be able to take apart and reassemble? BEST ANSWER: If you are talking about inserting these into the edge of the plywood that you will insert into a dado, I would not recommend it. They work by forcing themselves into a hole intentionally drilled too small. That's so that they can mash (as opposed to cut) the necessary threads they need for their holding power. This very action will split apart your plywood. These things work very well for their intended use, in the flat side of a piece of wood, even plyood. not sure I installed them in solid wood, plywood may not be suitable. what can i use to thead dowels and the corresponding hole? BEST ANSWER: To join dowels, I always use the threaded insert with steel hanger bolts. One dowel gets the insert and the corresponding dowel gets the steel hanger bolt and screw the dowels together. Note: be sure to find the center of each dowel before inserting the hardware. What is recommend hole diameter for the 5/16-18 in hardwood like oak, maple, or walnut? BEST ANSWER: I wouldn't use this in a hardwood. It is tapered, and a hardwood has little or no give. Rockler has other options where the shaft is straight. what hole size is required for the 1/4"-20 insert and how deep should the hole be drilled? BEST ANSWER: For softwoods, 11/32" is recommended, for hardwoods 3/8" is recommended.An 11/32" drill bit is hard to find. Not a standard size. 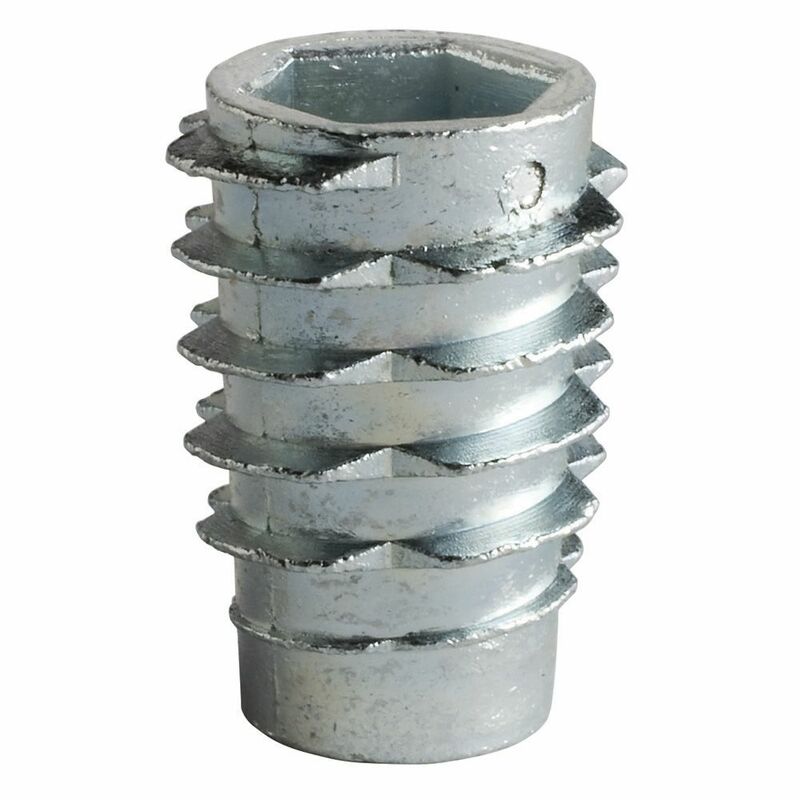 The hole depth depends upon the connector bolt length. Subtract the thickness of the wood being attached from the connector bolt length, & I add 1/4" to that number to keep from bottoming out. 1/2" in softwood, 7/16" in hardwood. These are good starting places drill a hole in as piece of scrap and try it. If you are carefully you can back the insert out to save for use. Also if you are using these for something that is going to be taken appart you should consider gluing the insert in, also pay attention to the material the screws are made from dissimilar metal corrosion could be a problem. As suggested, use 1/2 inch for hardwood, and 7/16 inch for softer wood. If you are using the Rockler bottle opener, ice cream scoops, or pizza cutters with the inserts, drill 1 1/8 inch deep. This will allow for the length of the tool being inserted. Install the insert about 1/16 inch below the edge of the wood. Good luck. What is recommend hole diameter for the 5/16-18 in soft wood? BEST ANSWER: 7/16 in soft wood, 1/2 in hard; use a drop of CA glue when final inserting, works well for me. I don't remember. Take a piece of scrap wood and drill some holes until you find the right size. Be aware that if you insert this near the end of a piece of lumber and the hole is too tight, you can split the wood. I need to purchase some of these. the ones I removed required a 5/16 hex head allen wrench. Is this, then, the size I need to buy as a replacement? BEST ANSWER: If they take a 5/16" bolt then that would be correct. How long is the 1/4"-20 threaded insert? thank you. that is too long for my project.